Stop buying breakfast tables because they're nothing more than a giant junk-mail bucket because nobody ever eats breakfast anymore because the 1960s are over. Sadly, our good friend cereal is a casualty. Recently the New York Times went deep on the fact that cereal, that great staple of the twentieth century, is suddenly a bad business to be in. Maybe that's thanks to the pace of modern life, where if you're lucky enough to have full-time employment you're likely in a perpetual state of smartphone-reinforced anxiety. Carbs and milk just don't sit right on the stomach anymore. Cereal makers are turning to increasingly desperate ploys, betting on commercials featuring obnoxious dads, for instance. 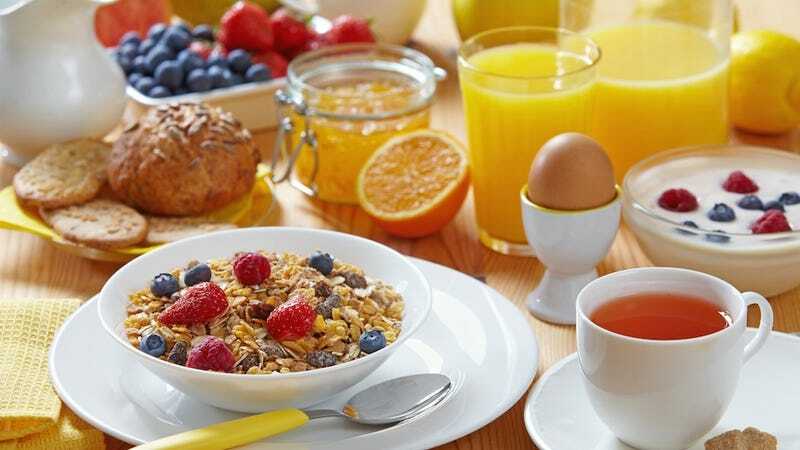 According to market research from NPD Group, US restaurant patrons have been going out for fewer lunches and dinners, but more breakfasts, than usual, and 2013 was the fourth year in a row that the number of consumer breakfast visits to restaurants increased. Today, "tons of dollars are being spent to convince consumers to try breakfast out of the home," says Eli Rosenberg of Food Genius, a data company that tracks restaurant trends. Weekday mornings are newly competitive turf for fast-food restaurants, especially, where breakfasts accounted for 92% of traffic growth between 2007 and 2012. The selfie toaster's gonna turn it all around, though, just you watch.